With the heating up of campaign rhetoric, I’ve been hearing a lot about this $716 billion dollars that Romney is publicly saying President Obama “robbed” from Medicare. That is the exact word Romney uses. Well, if someone is stealing, I want to know how they are getting away with it so I did my research and discovered what the $716 billion is. First, let me remind you that the Medicare trust fund does not have that much money and it’s not a piggy bank that can be raided. At the end of 2011 the Part A trust fund had only $244.2 billion. The Part A, hospital insurance program, is financed through a payroll tax that goes into a trust fund similar to the Social Security trust funds. And that hospital insurance trust fund is being spent much more rapidly than the Social Security funds. No president can actually take money out of the Medicare trust fund as this money is in Treasury bonds which can only be cashed by Medicare at any time it is needed. As it is, with the continued increase in medical cost, Medicare can’t cover all the benefits without either more revenue (taxes) or reduced spending. Sorry Romney, there is no “robbery”. These reductions do not take any money out of Medicare, they are necessary adjustments to vendors who receive Medicare payments, and do not affect payments to beneficiaries. They are aimed at insurance companies, hospitals, nursing homes and most of all, the Medicare Advantage companies. Medicare Advantage was started under President George W. Bush, with the idea that competition among the private insurers would reduce costs. But in recent years the plans have actually cost more than traditional Medicare. So the health care law scales back the payments to these private insurers. Medicare Advantage plans currently receive higher payments from the government on average than traditional Medicare – 9% higher than it was in 2010. The government pays Advantage companies 14-20% to manage patients health care. The Affordable Care Act cuts this fee to private companies. Romney and Ryan have a countdown clock showing how many days until Medicare (part A) is broke. The truth is that there would be even fewer days until the fund’s exhaustion if Obama’s health care law hadn’t included those $700 billion in spending reductions. Romney’s campaign ad incorrectly claims that the “money you paid” for Medicare is being used to pay for Obama’s health care law. It is incorrect because the law doesn’t take money out of the existing hospital insurance trust fund. It cuts the future growth of spending. And in the future, seniors will still receive the benefits to which they are entitled. This is a guest post from Barbara Moore. insurance companies must spend 80% of their premiums on health care or refund the difference. Americans are scheduled to receive $1.4 billion and Oklahomans $21 million in refunds this August. It would improve the competitiveness of American companies. Most working Americans obtain health insurance through their employers; however, this putsU.S.businesses at a disadvantage with foreign competitors. Small companies have the added disadvantage that they cannot negotiate rates as low as larger companies. It would cut down on the number of the uninsured using emergency services. Emergency room care is expensive and unpaid bills must be passed on to paying customers. It would reduce bankruptcies. A Harvard study found that about 50% of all bankruptcies in theUnited Statesare caused by illness and medical bills. Health providers, banks, businesses, and credit card companies who lose money in bankruptcies pass the cost on to the rest of us. It would improve everyone’s health. You and your family come into contact with many people each year. People without health insurance are less likely to receive immunizations and are much more likely to have untreated communicable diseases. The United States has just been through a recession that has left many Americans without jobs, financial security, and adequate healthcare. What could be a better time to see that every American has adequate healthcare? President Obama promised during his campaign to reform healthcare. 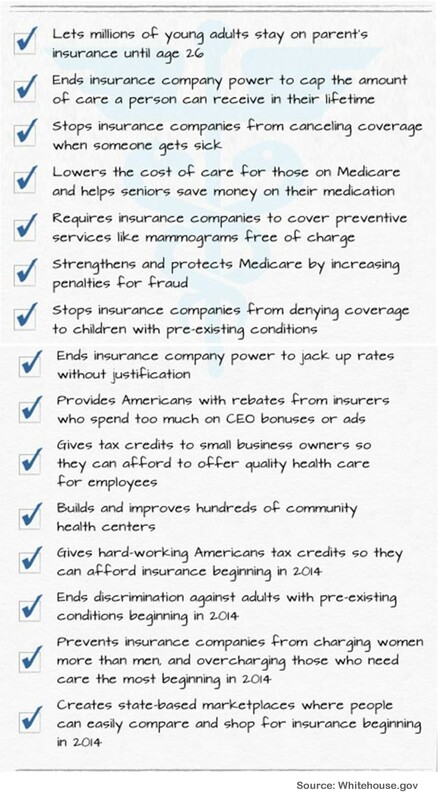 His goals were to protect citizens from insurance company abuses, see that every citizen had adequate healthcare, and ensure that healthcare was affordable. It was up to Congress to write the details of the law. For those who claim making law is like making sausages, the Affordable Care Act is more than an apt example. In the 1990’s, Hillary Clinton tried to reform healthcare – but attempts at reform stalled when Republicans came up with an alternate bill and the opportunity passed with no decision being made. In 2010, Congress used many of the ideas of the Republican bill to create the Affordable Care Act. Many of those ideas formed the basis of the Massachusetts health care bill that Governor Romney signed into law in 2006. The Affordable Care Act is certainly not ideal, but it came about as a series of compromises necessary to get it through Congress and avoid a filibuster in the Senate. Controversies: Much of the controversy over the Affordable Care Act was about things that didn’t really exist in the law. It did not create death panels, provide public funds for abortions, provide payments to undocumented immigrants, take away fundamental rights, or threaten to bankrupt the country. Although there were many claims that the affordable care act will greatly increase the deficit, the nonpartisan Congressional Budget Office predicted the affordable care act would decrease the projected deficit by $138 billion over the first 10 years and by approximately $1.2 trillion over the next 10 years. However, the laws constitutionality was a serious question – and several states filed suit claiming that the federal government could not require citizens to purchase health insurance. The lawsuits reached the Supreme Court and in National Federation of Independent Business v. Sebelius, 6/28/2012, the Supreme Court upheld the constitutionality of the Affordable Care Act. It ruled that the penalty for not purchasing insurance was a tax, and that Congress had a right to impose taxes. It would cut the unpaid bills for emergency services. Currently, emergency rooms are required by law to treat everyone, and those without medical insurance often use them for medical care when they cannot pay. Emergency room care is expensive and those costs must be passed on to paying customers. It would improve the competitiveness of American companies. Most working Americans obtain health insurance through their employers; however, this puts U.S.businesses at a disadvantage with foreign competitors who do not provide health insurance for their workers. Small companies have the added disadvantage that they cannot negotiate as low rates as larger companies. It would reduce bankruptcies. A Harvard study found that about 50% of all bankruptcies in the United States are caused by illness and unpaid medical bills. Bankruptcies affect everyone because the health providers, banks, businesses, and credit card companies who lose money in the bankruptcy pass the cost on to the rest of us. It would improve everyone’s health. Your family’s health depends on the health of everyone. You and your family will likely come into contact with thousands of people during this next year. People without health insurance are less likely to receive immunizations and are much more likely to have untreated communicable diseases. Insurance companies no longer have unchecked power to cancel your policy, deny you coverage, or charge women more than men. Soon, no American will ever again be denied care or charged more due to a pre-existing condition, like cancer or even asthma. Preventive care will still be covered free of charge by insurance companies–including mammograms for women and wellness visits for seniors. By August, millions of Americans will receive a rebate because their insurance company spent too much of their premium on administrative costs or CEO bonuses. 5.3 million seniors will continue to save $600 a year on their prescription drugs. Efforts to strengthen and protect Medicare by cracking down on waste, fraud, and abuse will remain in place. 6.6 million young adults will still be able to stay on their family’s plan until they’re 26. A major impact of the Court’s decision is the 129 million people with pre-existing conditions and millions of middle class families who will have the security of affordable health coverage. Should Entitlement Programs Be Reformed? Many who are successful attribute it to their ability and hard work. That is often true, but most Americans also owe their success to the opportunities, education, and resources that our country provides us – and also to good fortune. Our country provides safety nets so that no matter how fortunate or unfortunate a person is in their life, they will receive healthcare and not be destitute in old age. Those safety nets are often called “entitlements programs “, and that is true. We all pay to support those programs through taxes and contributions and we are all entitled to the benefits. Those who do not need the safety nets, or who do not wish to pay their share, often want to reform them in ways consistent with their self-interest. In the Tulsa World article, “Social Security, health care reform needed”, John Brock lays out a plan to remove government from managing retirement funds, Social Security, workers compensation, and health care. Mr. Brock says “the solution to our government’s problems is to empower people to manage their own affairs.” Though empowering people sounds good, the article is based upon questionable assumptions. The first assumption is “that the government is controlling our lives more and more.” That is a common theme in politics these days, but hardly true. We democratically elect our representatives and leaders, and we have much more control over our government than probably any other country in the world. The second is “having a government manage these necessities is risky. “ He points out that Greece, Spain, and a number of state and local governments are having financial problems. That’s true, but is not necessarily because of their entitlement programs. Many of the problems stem from the fact that the wealthy have found ways to reduce or avoid paying taxes. He goes on: “For decades governments have been taking on future obligations without making provisions to cover the costs.” However, in many cases, provisions were made to cover the cost but later tax cuts reduced the expected revenues. Then, there are many who do not think that teachers, policeman, fireman, serviceman, and other government employees are worth the retirement funds provided them. The next assumption is that Social Security “will default in the near future”. The Social Security trust fund is adequate to pay benefits through 2023, and raising the FICA cap could extend it through 2080. The Social Security Trust Fund is invested in US Treasury bonds, which earn interest and are as solid as theUS government. We are lucky that Social Security was not privatized in 2006, as the recession would have wiped out much of our retirement savings. The final assumption is that we all have the time and the expertise necessary to deal with the work that Mr. Brock’s plan would require. Those who are wealthy and lucky would certainly profit from managing their own accounts, but those who lack expertise or are not lucky may end up with no medical care provisions or retirement funds. The idea of insurance is to spread risk and the larger the population, the less expensive and more reliable insurance is. Spreading the risk over every citizen increases the efficiency and provides a safety net for everyone. We are lucky to live in a country where we enjoy the benefits that self governance and cooperation affords us. We should resist efforts to remove programs which provide our safety nets from government management, particularly if it makes them less reliable or managed by those who desire to profit from them. You would not think that if you read George Will’s article “Obamacare: Regulatory state’s war on business”. He tells how Carl Karcher built his hotdog cart business up to Carl’s Jr. Restaurants, now CKE Industries, a multibillion dollar business. However, Mr. Karcher passed on in 2008 and Mr. Will has written an anecdotal story based upon quotes from CEO Andy Puzder. He claims that “CKE’s health care advisers, citing Obamacare’s complexities, opacities and uncertainties, said it would add between $7.3 million and $35.1 million to the company’s $12 million health care costs in 2010, unless CKE converted many of its full-time employees to part time.“ He felt it would be necessary to do that to avoid providing them with the health insurance required by Obamacare. The article goes on, blaming Obama’s policies for the poor economic climate, the high cost of fuel prices, and for creating “ multitudes of regulators who regard business as the enemy” and are conducting a “regulatory state’s war on business”. Although the healthcare bill is called Obamacare, Mr. Will should remember that what we have is not the universal health care that President Obama wanted. It is the half-a-loaf that remained after the compromises necessary to get the bill through Congress and overcome the Senate’s plan to filibuster it. Had universal care been enacted, CKE and other businesses would not be responsible for providing health care for their workers. Mr. Puzder apparently also missed the point that even now Obamacare requires that insurance companies use 80% of the premiums collected to pay for healthcare. In many cases, this will mean lower premiums and rebates to the insured *. The affordable health care act was passed requiring universal coverage, but Congress weakened the restrictions on what insurance companies can charge. The problems CKE has in covering employees with health insurance is more the fault of Congress than of the administration. There is also an ethical problem that Mr. Will passed over. Most of CKE Industries’ employees work for near minimum wage and are covered by the company’s “mini-med health care program”. If that program does not meet the requirements of Obamacare, is it adequate to cover their needs if they have a serious health problem? Mr. Karcher is not here to speak for what he would do, but Mr. Puzder apparently sees it as a trade-off between job creation and providing adequate health care for his employees. He is apparently willing to convert many employees to part time in order to cut costs on their health care. In 2007, before the company went private, CKE Restaurants, Inc. earned revenues of approximately $1.5 billion. Is it possible that Mr. Puzder is making a trade-off between his employees’ healthcare and the company’s bottom line? Perhaps Mr. Will should look into that issue. * Note: Under the Affordable Health Care Act, health insurers must pay 80% of the premiums collected for medical expenses or return the difference. Here is a list, by state of the amount expected be refunded under this provision. Privatization. It is usually assumed that private enterprise will find efficient ways to do things and lower costs to the benefit of consumers and taxpayers. That assumption is probably true when it comes to providing innovation and developing resources. The recent failure of some of our largest private companies have caused an economic downturn which, along with tax cuts, have left the federal, state, and local governments with financial problems. Privatizing public services and resources is being considered as a way to reduce costs and raise money. City Services: As a way to save money, many small towns and cities are considering turning their basic services such as water, trash and sewer over to private companies. This has not always worked out well. As an example, Coatesville, Penn decided to sell off its drinking water and wastewater infrastructure in 2001 and invest the money in a trust fund to be used for city services. But privatization hasn’t been the economic boon the city hoped. The residents have seen their water and sewer rates jump 85 percent since American Water, the largest water corporation in the country, took the helm. Last year the company proposed a 229 % rate hike for sewer services, forcing the city to cobble together money for legal fees to fight back. (1) Privatization doesn’t always promote efficiency. The trash in Wichita, Kansas is collected by several private trash companies, and customers in any part of town can contract with any of the companies. The result is that several large trash trucks navigate most streets of Wichita each week, resulting in increased noise, wasted energy, more exhaust fumes, and damage to the streets, which of course, the city repairs. Even though residents of Wichita pay 30 to 50% more than residents of comparable cities with public trash services, a measure to franchise the trash system was defeated amid criticisms of “government control” and “loss of freedom to choose”. Medicare and Social Security. Privatization of Government services for ideological reasons often fails as a practical way to lower costs. While privatizing Medicare was ostensibly done to reduce costs, the Medicare Advantage Plans created have increased the cost to the government by 14% and decreased the long term stability of the program. Also, to reduce costs, the plans created the infamous “donut hole“ that costs seniors an additional $25 billion annually. (3) The cost created by privatizing is not a mystery, as the VA and Medicare have a 3-5% overhead while private insurance companies have an overhead of 15% or more. That is something that should be considered when thinking of health care reform. Public Service: Our public servants, teachers, firefighters, police, military personnel, and the myriad employees that run our country, actually serve us well. Their pay is usually determined by their responsibilities, experience, and education, as in the GS ratings of federal employees that determine their compensation. Public servants seldom receive bonuses and sometimes little appreciation for doing their job well. The government does not make a profit so their services can be provided at lower cost. And, while we have little say about what goes on in the boardroom, our elected representatives are in charge of public employees. While it may not be the role of government to compete with private industry, it is certainly not the role of government to make policies that favor private companies over the needs of our citizens. Certainly, privatization for purely ideological reasons is a bad idea that should not override practical considerations. Update on 10/26/2016: Here is another case of a privatized water system that didn’t work out well that cities should consider before privatizing.